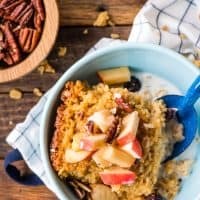 This Amish Baked Oatmeal is one of my favorite breakfasts of all time! Sweet, crumbly, and super hearty, it’s the best way to kick start a chilly fall morning. 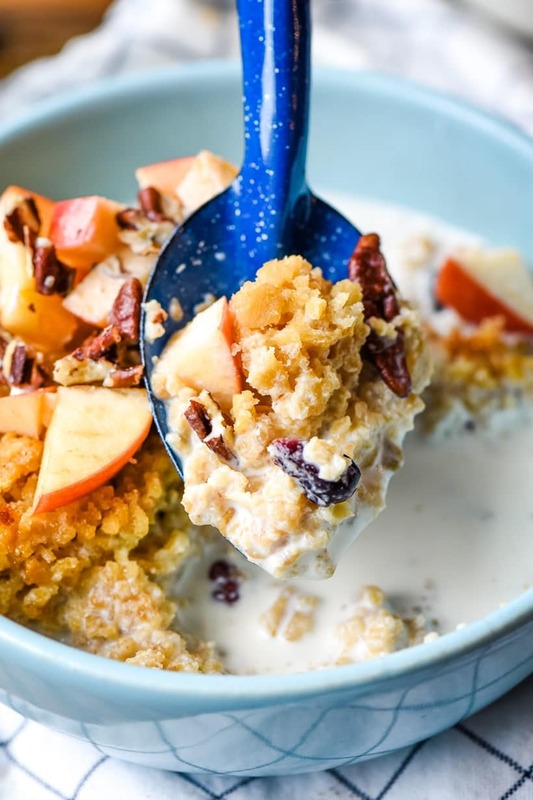 Long before baked oatmeal became a Pinterest sensation, I was eating it around a crowded cafeteria table at the Mennonite summer camp I attended every year from 6th-12th grade. Baked oatmeal morning was every camper’s favorite morning of the week. There’s something magical about this pan of crumbly, sweet and toasty oats. I mean, any recipe that can get a camp full of angsty, eye rolling teenagers excited for breakfast must be pretty special. 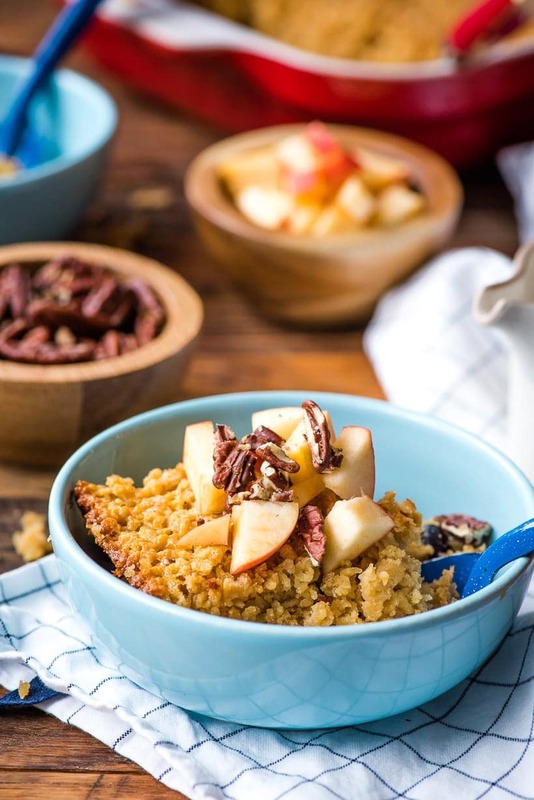 I’ve shared a similar recipe for Apple, Pear, and Almond Baked Oatmeal in the past, but this Amish Baked Oatmeal is the original. It’s what inspired my love of this hearty breakfast, and it continues to be the recipe I crave throughout the fall and winter months. I’ll tell you right up front this isn’t the healthiest baked oatmeal recipe you’ll find on the Internet. 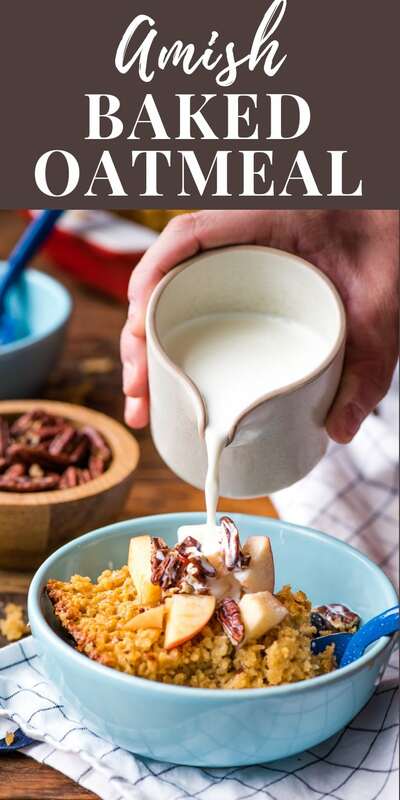 I’ll also tell you I’ve tried some of those healthy baked oatmeal recipes, and they don’t hold a candle to this classic Amish version. This Amish Baked Oatmeal is the ultimate hearty, comforting breakfast. The batter is rich with milk, butter, and eggs, and uses a combination of rolled oats and quick oats to create the perfect texture–a just right blend between crumbly and cakey. If you’re thinking this must taste like eating a warm oatmeal cookie for breakfast, you’d be correct. The only difference is this breakfast will keep you pleasantly full and satisfied all morning long. Like most Amish recipes, this one feeds a crowd. 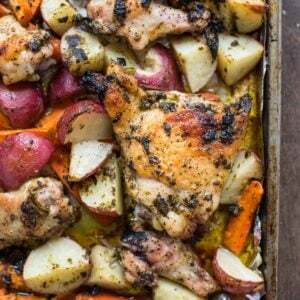 I make it in a 9 x 13 inch pan, which can provide at least 12 people with a thick, hearty slice. I love to make a pan on Sunday and eat it throughout the week. However, if you feel the recipe might make more than your family can handle, you can absolutely halve it OR freeze leftovers for super quick weekday breakfasts (more on that below)! What should I serve with baked oatmeal? Many people like to add dried fruits, fresh berries, or nuts directly to their baked oatmeal batter. This is absolutely an option, and if you’re a lover of oatmeal raisin cookies I would definitely recommend adding raisins to the batter. That said, I prefer to keep my baked oatmeal plan, but serve it with different toppings depending on my mood and the season. In the spring and summer I gravitate towards blueberries, strawberries, raspberries, and peaches. In the fall, I love to serve this with cut up apples and pears. Winter has me reaching for sliced bananas, pecans, and coconut. No matter what the season, I make sure to have plenty of milk on hand for drizzling on top. This Amish Baked Oatmeal is also great crumbled on a bowl of Greek yogurt. 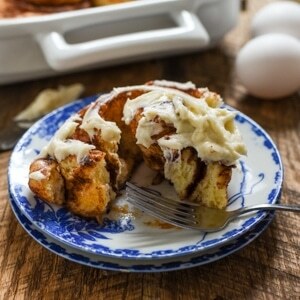 I find the recipe is sweet enough on its own, but you can also have maple syrup or brown sugar on hand for guests who would like it a little sweeter. Can I make baked oatmeal ahead of time? Yes! Simply mix it up, refrigerate overnight, and bake as directed in the morning! It also reheats incredibly well, so you can bake this one day and reheat the whole pan in the oven or individual slices in the microwave throughout the week. Can I freeze baked oatmeal? Absolutely. There are two ways to freeze. First, you can bake the recipe then cover tightly and freeze the entire pan. Remove the pan from the freezer the night before you plan to make it and allow it to thaw in the fridge overnight. In the morning, warm it in a 350 degree oven for 15-20 minutes. Secondly, you can bake the recipe then cut out individual slices to wrap and freeze. This method is great for quick breakfasts! Simply place single serving sizes in plastic wrap or freezer safe containers. When you’re ready to eat, unwrap, place in a microwave safe bowl and microwave for 1 minute. If needed, microwave for another 30-60 seconds. That’s it! 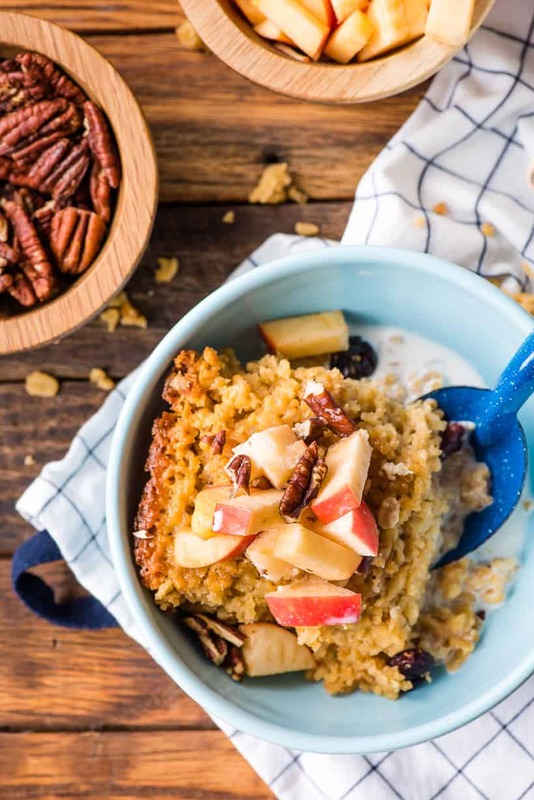 This hearty Amish Baked Oatmeal is a warm, comforting way to start your day. Preheat the oven to 350 degrees. Grease a 9 x 13 inch pan. In a large mixing bowl, cream together the butter and sugar until well combined. Add the eggs one at a time, beating well after each addition. Stir in the vanilla. Add the oats, baking powder, salt, and cinnamon if using and gently stir until the mixture starts to come together. Add the milk and beat on low speed until combined. Stir in the dried fruit if using. Bake in a 9x13 inch pan at 350 for 28-35 minutes or until the mixture is golden brown and appears set. 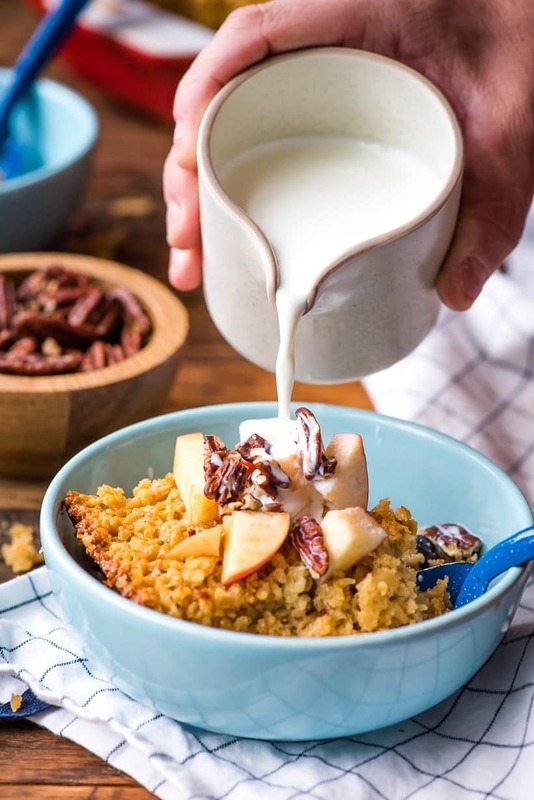 Serve baked oatmeal warm with milk, fruits, nuts, and other toppings. You can sub all old fashioned or all quick oats for this recipe, though the texture will be slightly different. This baked oatmeal can be baked in advance, refrigerated overnight, and rewarmed in a hot oven in the morning. Individual slices of baked oatmeal can also be wrapped in saran wrap and frozen. When you're ready to eat, unwrap, place in a microwave safe bowl and microwave for 1 minute. If needed, microwave for another 30-60 seconds. The calories are calculated without the dried fruit. The calories go up to 411 per serving with the dried fruit. This recipe is naturally gluten free, but you'll want to make sure your oats are certified gluten free. 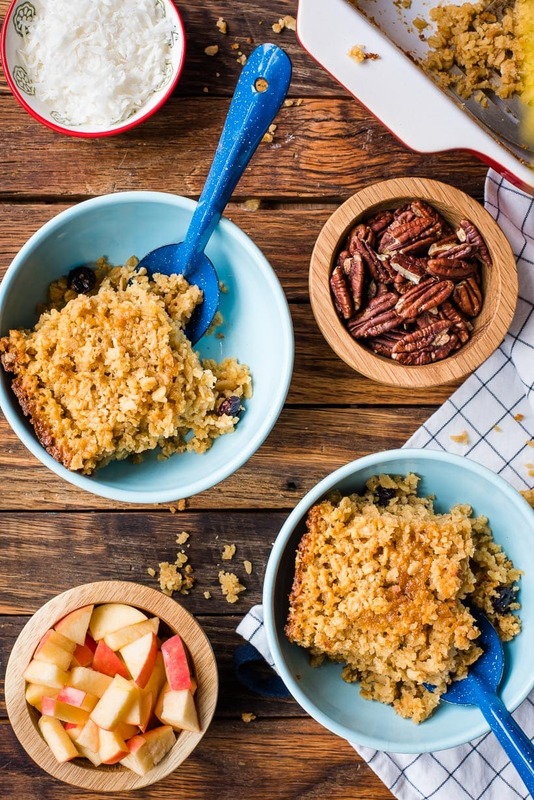 We tried this Amish Baked Oatmeal this week and it’s a “Keeper”! You were right, it’s like eating a warm oatmeal cookie with milk. Loved the textures of the crisp top and the chewy part under that. The old fashioned oats give it a nice hearty chewiness. I agree that it was sweet enough that we didn’t need to add any extra sugar when it was served. Perfect amount of cinnamon too. The left-overs were so easy to reheat in the microwave. Thanks for a terrific breakfast recipe for us to enjoy.